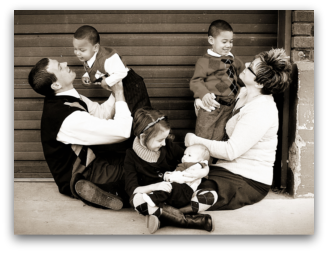 Our family has been very blessed by the miracle of adoption! 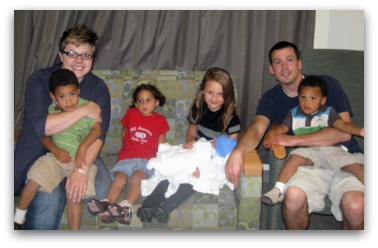 We have four children, all whom were adopted! Our oldest, Tia (born in 2005) came into our lives after a long struggle with infertility that left me having to have a hysterectomy at the age of 23. She filled the holes that were so deep in our hearts and mended are heartaches. She was such a joy and we couldn’t wait to add another child into our family. We were also lucky enough to have a very open adoption with her birthmom, (who is one of the most amazing women we have ever met) and loved every minute of it. Her bravery and maturity completely amazed us! We still maintain a close relationship with her and love seeing her as much as possible! The love that we feel for her cannot be expressed in words; she truly is our angel on earth. 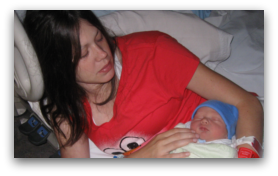 In the summer of 2007 I contacted Heart to Heart Adoptions about one of their “urgent situations.” Luckily for the baby, they had found him a loving home, but I was able to forge a great relationship with the caseworker Sarah. I told her we were looking to adopt again (we had previously used another agency with Tia) and that if another “urgent situation” were to come up, to call me! She suggested that we get our paper work completed so that we could be an “official” waiting couple. I told her that I would talk to my husband and contact them when I was ready. A few weeks later I received a phone call while at a family reunion from one of the caseworkers stating they had a baby that was born and that, unfortunately the family that was suppose to adopt him had backed out. I was immediately connected to this situation-I wanted this baby! I told the caseworker that we didn’t quite have our homestudy completed and she said that because it was an urgent placement, it just wasn’t going to work out. I reluctantly agreed and went back to the reunion and tried not to think about this little boy. Two days later I got another call from the same caseworker saying that she, for some reason, she couldn’t get our family out of her head and that she thought we might just be this little guys parents. I immediately got off the phone and told my husband. We had only a few minutes to decide-we prayed, and prayed and prayed. We both felt the same way-she was right, we were his parents! We then got in the car and drove down to Salt Lake to meet our son. What an AMAZING feeling. I was on cloud nine! He was PERFECT and we loved him immediately. Our caseworker was amazing! You could tell that she really wanted a great home for this guy and that’s why I was so drawn to Heart to Heart. We got to spend a few hours with him and feed him. The whole day was magical and we just were pinching ourselves because we couldn’t believe that we had a son, who we named Kendall! A couple days later we had arranged to meet our son Kendall’s birthmother at a local restaurant. We were nervous as ever! She walked in and she was just beautiful. She was quite shy and quiet at first, but she warmed up to us fast and we began to feel comfortable. She had a child before our son that she is parenting and we were able to meet her. We fell instantly in love with her too! We were sure glad that we were able to meet her! She didn’t want any more contact than that because she had placed a baby for adoption previously and had had a bad experience because the adoptive couple didn’t keep their promises (please keep your promises that you make with your birthparents)! So she felt it best just to meet us and not talk or write to us again. Although I was reluctant to have a “closed adoption,” it was what she wanted and I would honor her wishes. We took Kendall home and loved on him. We were in complete awe of the miracle of adoption once again and felt overwhelmed with gratitude for this wonderful gift this woman had given us. I became almost sad that I couldn’t talk/hear from our son’s birthmom. I wanted her to know that he had a million people that loved and adored him, that his grandma can’t get enough of him, or that he likes his bottles really warm! Then, one afternoon I received a phone call from a caseworker at Heart to Heart saying that Kim would like to talk to me!! I was elated! I couldn’t believe what I was hearing! They said that they would set up a conference call with her and have her caseworker call my caseworker, etc. I, being a little too assertive at times, said “just give her my phone number!” I think the caseworker was a little shocked-but I was okay with her having such a simple thing. A few minutes later I received another phone call-this time it was Kim. I recognized her soft southern accent! She asked me about the baby and how he was doing and she told me how she was feeling and what not. Things were easy not forced. She could sense I wasn’t bothered by her call, that in fact, I was excited to talk to her! Things changed that day. I began to earn Kim’s trust. She came to learn and understand that I loved her, and not just for what she had done for me, but for the person she was. We began what was about a once a day phone call friendship. Sometimes we would talk for hours, or sometimes just a few minutes, but in conversations built a solid friendship that both of us enjoyed. When Kendall was about eight months old I received a phone call from Kim stating that she “thought” she was pregnant. I asked if she “thought” or “knew”. She hadn’t taken a test yet so I told her to go and get a test. She did and it came back that she was indeed pregnant. She almost immediately told me that she wasn’t in a place to parent again and wanted to know if we would adopt this baby. We were taken back at first, but were very excited to add another child to the family! Isaac was born in November of 2008 and was absolutely PERFECT! He was the most loveable baby you could ever meet! We maintained the same relationship with Kim and loved hearing how she was doing. In January of 2009 Kim called and said she was pregnant again and would like us to adopt the baby. We were again on cloud nine at the thought of having FOUR children! Bronson was born in September of 2010 and is too an amazing baby that is as cute as can be! We feel so incredibly blessed to have had such miracles happen for our family. Heart to Heart Adoptions was one of those miracles in our life. The knowledge, experience, and willingness to go the extra mile exemplified by the case workers at Heart to Heart have made our adoption experiences beautiful ones. We saw with our own eyes the level of care and concern they have for the birthmothers they work with and that is why I have such a high regard for them. One of our favorite sayings is, “If you don’t believe in angels, you’ve never met a birthmother!” We believe this is how Heart to Heart sees their birthmothers, and that is why they are as successful as they are. The baby itself is a miracle, but that miracle wouldn’t even be here if it weren’t for that birthmother willing to make such a large sacrifice on the behalf of the child!